Yorkies are popular lap dogs that thrive in apartments. A dog can add warmth and liven up any home. Both Yorkshire terriers and bichon frises are intelligent and highly adaptable to changes, and their size makes them excellent apartment dogs. With proper training, either a Yorkie or a bichon could be the perfect companion for a young couple beginning life together. Bichons are known for being a bit clownish, and it’s no wonder. Historically, bichons were used in circuses. Contemporary bichons are highly active, playful, affectionate and friendly. Yorkies can be mischievous and are fiercely independent, but they do love attention and have an innate desire to please their owners. 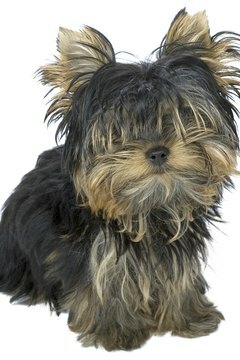 Like bichons, Yorkies are very active, but both breeds appreciate cuddling with their owners. Puppies should be fed specially-formulated puppy food, which provides additional nutrients that puppies need to grow properly. Small dogs like Yorkies and bichons reach maturity more quickly than larger breeds. A veterinarian can recommend the best food and advise on the amount to feed your puppy each day. Neither of these dogs is low-maintenance. Both breeds should be brushed at least once a day, and regular trips to a professional groomer for trims are a must. On the plus side, neither Yorkies nor bichons shed much, if at all. Both bichons and Yorkies are active, affable dogs who love to exercise and play games with their owners. Their desire to please combined with their love of attention means both breeds are very responsive to training. They do have reputations for being difficult to house train, and they may develop separation anxiety. But with consistent training loaded with plenty of positive reinforcement, they will be happy and well-behaved companions. 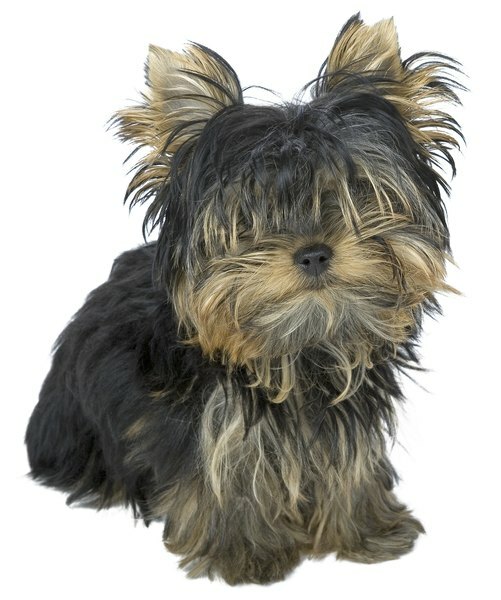 If you’ve decided on a Yorkie or a bichon, take care to puppy-proof your home before the puppy arrives. Yorkies in particular are very curious and will try to investigate everything. Cabinets in kitchens or bathrooms within paws’ reach of a puppy can be fastened with childproof latches to keep your puppy from opening them and accessing cleaning supplies, soaps or medicines. In the bathroom, the toilet lid should be kept down at all times. Otherwise, a curious puppy could fall in and drown. Finally, hide or put away anything, from power cords to shoes, that you don’t want your teething puppy to chew. Dog Time: Feeding a Puppy: How Much to Feed a Puppy?